A wild mushroom eaten by foraging enthusiasts across Europe has been found to contain dangerous and potentially lethal toxins. Chinese scientists believe they have identified the mushroom toxins that cause rhabdomyolysis – a sometimes fatal disease that can irreparably damages the kidneys – that was first reported 15 years ago in France. 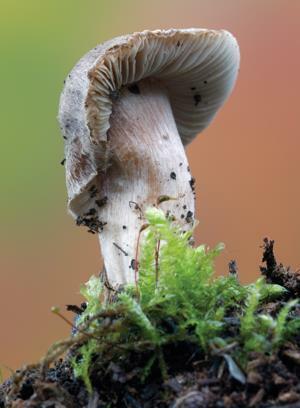 However, the toxins were not isolated from the mushroom Tricholoma equestre that was thought to be responsible for the deaths, but from Tricholoma terreum, its close relative, highlighting the complexity of fungus toxicology. These scientists are recommending that people who forage for mushrooms avoid eating both of these species. Both T. equestre and T.terreum are part of a family of wild mushrooms that were thought to be edible. A 2001 study reported that between 1992 and 2000 there were 12 severe human rhabdomyolysis cases that led to three deaths.1 The cases occurred approximately a week after the patients ate wild mushrooms that were thought to be T. equestre. By feeding mice T. equestre and measuring serum creatine kinase levels – a marker for rhabdomyolysis – the researchers concluded in 2001 that this mushroom was the culprit. However, to date, no work has been carried out to identify exactly which chemicals in T. equestre cause rhabdomyolysis. Liu Jikai, a senior scientist at Kunming Institute of Botany, Chinese Academy of Sciences, and his team collected samples of both T. equestre and T.terreum from beneath pine trees on the sandy coast of south-western France. They isolated 15 new triterpenoid terreolides and saponaceolides from the T. terreum.2 Two saponaceolides demonstrated acute toxicity, killing mice at 88.3 and 63.7mg/kg of body weight. Both compounds increased serum creatine kinase levels in mice. 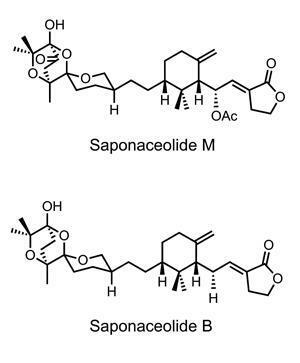 ‘The two new compounds are of medium toxicity, so it is possible that they work together, perhaps with other unknown mushroom toxins, in a cumulative way to cause lethal rhabdomyolysis,’ Liu tells Chemistry World. He estimates that a person would have to eat a portion of T. terreum every day for several days before the dose would be deadly. He says that it is fortunate that T. terreum, prized for its flavour, is only eaten in small quantities or there might have been more fatalities. Liu says his team also identified T. equestre extracts that are toxic but that the toxins differed from those found in T. terreum. These data have not been published yet. ‘It is possible that the rhabdomyolysis patients ate both T. equestre and T.terreum or some of them confused T.terreum with T. equestre,’ he says. In 2012, Liu’s team published another study suggesting a combination of three types of mushroom toxins may have been responsible for more than 200 deaths in China. T. equestre is the most famous deadly mushroom for which the corresponding toxins are still unidentified, according to Kimiko Hashimoto, an organic chemist at Kyoto Pharmaceutical University in Japan. But Hashimoto disagrees that T.terreum is the culprit in the poisonings attributed to T. equestre. This is because poisonings caused by T. equestre have been reported in both France and Poland. Although Liu’s research based on samples from France link T.terreum to rhabdomyolysis, the Polish cases may still prove a link between T. equestre and the disease. In addition, T.terreum and T. equestre look quite different, so the two mushrooms should not be easily confused. ‘T. terreum has a grey cap and white flesh, [while] T. equestre has a yellow to brown cap and yellow flesh,’ Hashimoto says. Li Taihui, a fungus taxonomist at Guangdong Institute of Microbiology in China, says Liu’s research indicates the complexity of fungus toxicity. ‘One toxic mushroom can contain different types of toxins and the same toxin’s toxicity can change in accordance with the environment,’ says Li, adding that it is easy to make a mistake when identifying fungi because there are so many of them. ‘Thus, it is important to identify the level of toxicity resulting from consuming different amounts and different combinations of mushrooms,’ Li explains.